The first ever mechanized vehicle used by Valley Electric Association (VEA) is back on the road once again. A classic 1943 Chevrolet “Highway Digger” truck was recently restored to pristine condition by the co-op. 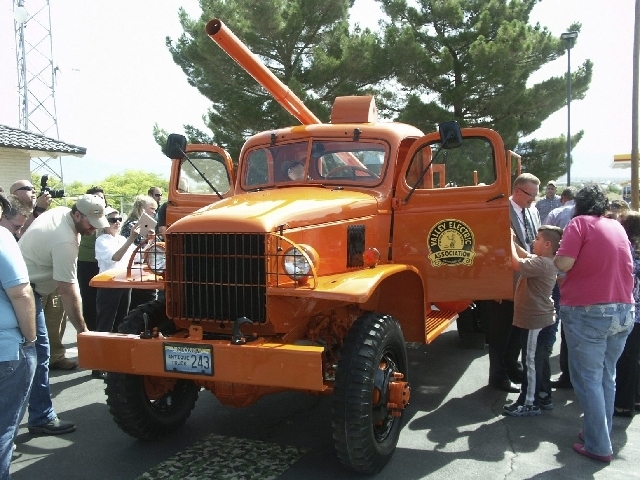 VEA CEO Tom Husted said the 70-year-old utility truck was displayed at the Pahrump Museum until VEA took possession earlier this year. “It was originally a military designed truck and it was used for digging holes for the setting of poles. We acquired it through the generosity of the museum where it was donated in 1995, and it had just been sitting idly there deteriorating. I had a conversation with the museum board to see if we could get it back and restore it. In appreciation we are going to make a donation of funds and services to them so that they can do another project,” he said. Husted said the vehicle underwent a complete makeover by a team of local mechanics and machinists. “Top Notch Repairs here in Pahrump did the restoration process for us. We went through a long list of possible candidates that can provide restorations on a piece of equipment like this. Obviously it was slightly narrowed down because to do it from stem to stern and have that expertise is pretty limited. They fit the bill and most importantly, they were local. They did this restoration in five weeks and put in over 2,000 hours of work to be able to complete this,” he said. Husted also said the truck eventually arrived back in VEA’s hands by way of Utah and the generosity of the late Harry Ford, who founded the museum along with Charles Gallivan back in 1992. “When it became obsolete in our fleet, we sold it and it ended up in Utah where a local rancher there used it to dig holes. His affiliation and friendship with Harry Ford, who had also been a donator to the museum came across this and made the arrangements through Valley Electric to get it back. It has been at the museum since 1995 and when I became aware of it about six weeks ago, I thought that we needed to get the truck back and restore it. We are very thankful to the museum for the services they provide and the opportunity to bring the truck back to life,” he said. The CEO also said the more than 90 percent of the truck was restored to its original luster all the way down to its leaf spring suspension. The vehicle will also be used in local events and for parades. “Ninety-five percent is original, including the paint. It will remain here at Valley Electric where we will keep it under wraps. It’s definitely not going back into the fleet for daily use. We will use it for parades and the local car shows from Sandy Valley to Fish Lake Valley within our service area. We will also take it back to the museum for their special occasions. It will be a community event vehicle,” he said. There was no word from VEA on how much was spent to restore the vehicle.